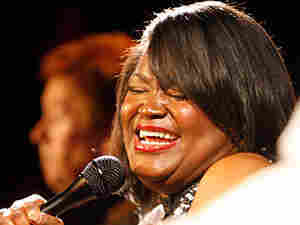 Shemekia Copeland: The Joy Of Singing Blues Copeland knows the blues, but maintains that singing it doesn't have to be sad. Some of the songs on her new album, Never Going Back, touch on hardship and loss. But she focuses on empowerment instead of wallowing in defeat. Hear songs from Shemekia Copeland's new album, Never Going Back. Mahalia Jackson, the great gospel diva, once said, "Anybody that sings the blues is in a deep pit, yelling for help." Singer Shemekia Copeland knows the blues, but maintains that singing it doesn't always have to be sad. "I think blues gets a bad rap for its name, unfortunately," Copeland says. "Blues is just like country, in that it's just telling stories. Sometimes they're sad and sometimes they're happy. I have a song on a previous record called 'I'm a Wild Woman and You're a Lucky Man.' There's nothing sad about that." Some of the robust and soulful songs on her new album, Never Going Back, touch on hardship and loss. But she doesn't sing of defeat, focusing instead on empowerment and hope in the lives of modern women. One such track, "Rise Up," chronicles a young woman who's trying to pick up her life after a troubled relationship. "It's just one of those good old inspirational woman songs," she says. "Times have changed, and we're no longer on the back burner. I just want women to feel really good and confident in themselves and who they are." Copeland grew up singing with her father, the legendary blues guitarist Johnny Clyde Copeland. Whereas some children rebel against their parents' influence, Copeland embraced it. She was afraid of performing, but singing came to her naturally. "It was just something I knew how to do," she says. "I didn't realize it was a gift. It was just something I did around the house with my daddy." On Never Going Back, Copeland covers one of her father's songs, "Circumstances." The lyrics recall his experience during the recession of the '70s, when he had to take a day job at a burger restaurant in New York and play the blues at night. Copeland says its message still holds true today. "You have some very highly educated people that can't find jobs because of circumstances, because of the way the world is right now," she says. "This one was perfect for this record." Copeland says she doesn't want to limit herself to lamentation, just because the songs she sings are blues. "There are only two different styles of music, and that's good and bad," she says. "B.B. King said that."